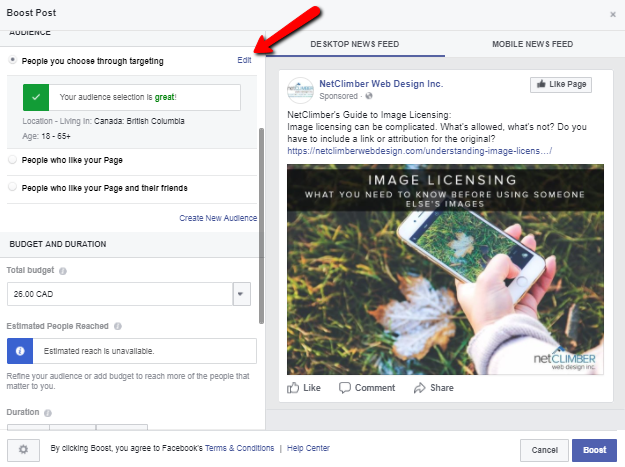 Boosting is an effective way to increase the number of people who are viewing and engaging with your Facebook posts. 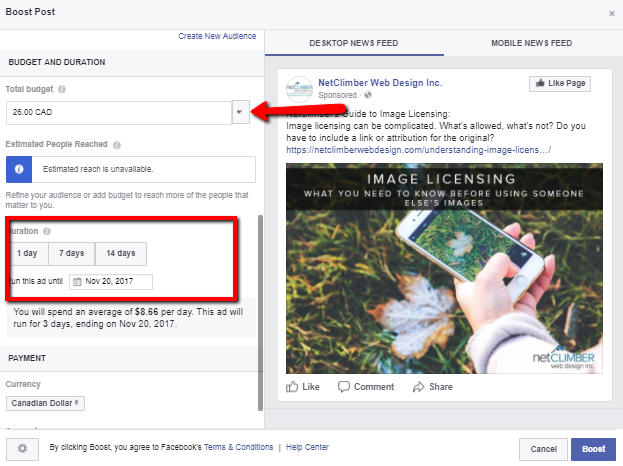 It is a paid promotion where you set a specific budget and time-frame, Facebook will then promote your post to your selected audience during that set time. Depending on the goal that you have established Facebook will charge you X amount for each goal it achieves for you. 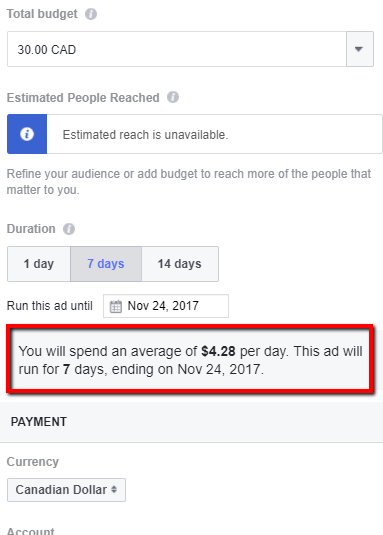 If your goal is to get as many impressions as possible Facebook will assign a dollar value to every 1,000 impressions and charge you accordingly. 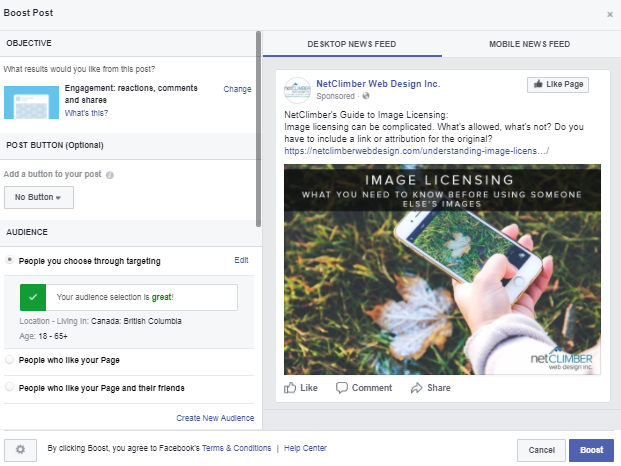 Similarly, if your goal is to get like and comments Facebook will assign a dollar value to every interaction with your post and charge you according to how many interactions it believes you will get within your given budget. 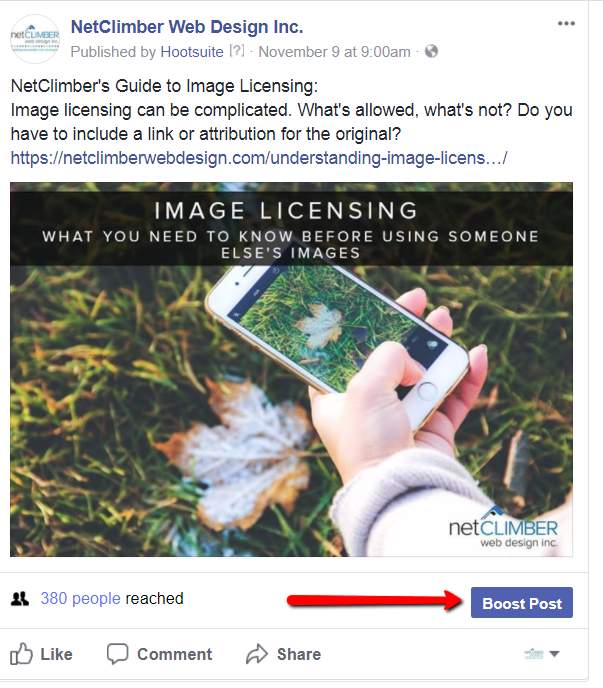 Boosting is an excellent way to not only increase the reach of your post but also make sure it is reaching the right people. 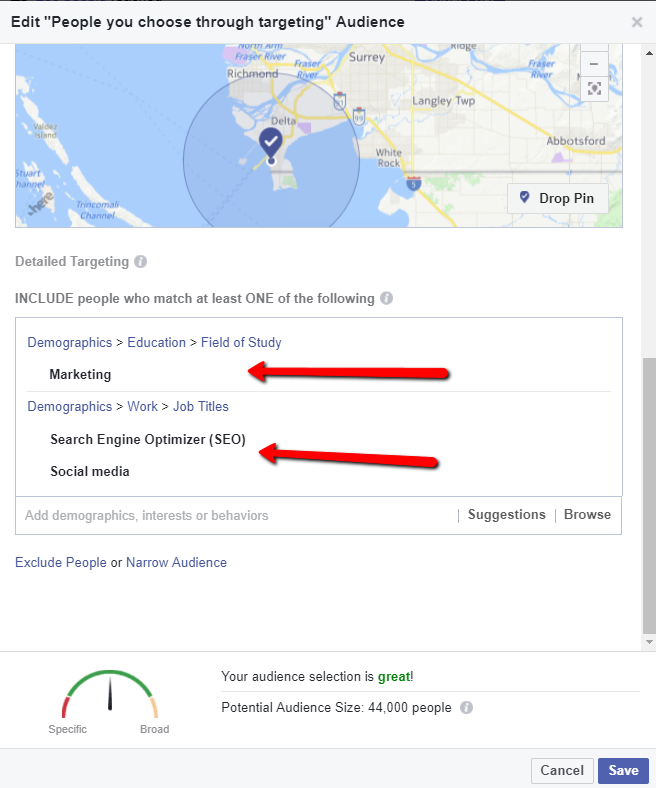 Boosting posts on Facebook allows you to target specific geo-locations, age ranges, genders, and filter based on interests, jobs, and companies. 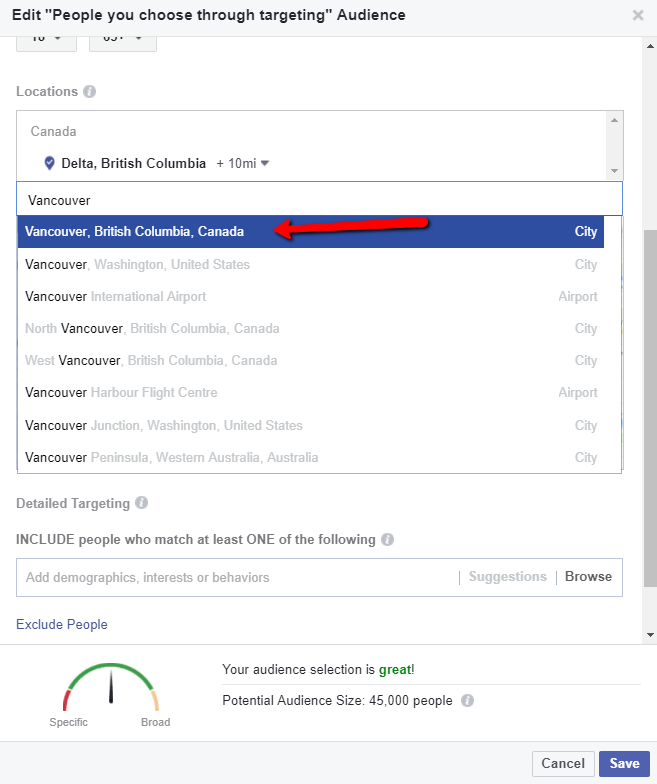 It is an effective way to grow your Facebook page’s audience. This will cause a window to pop open, this is where all the settings are created for promoting your post. 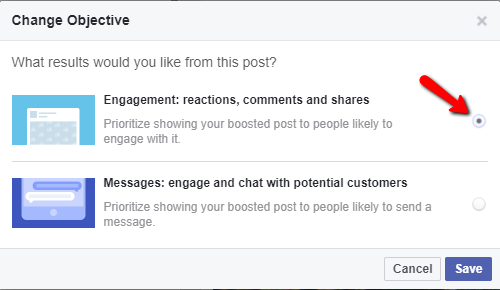 Select change to view the different objectives available for your specific post type. 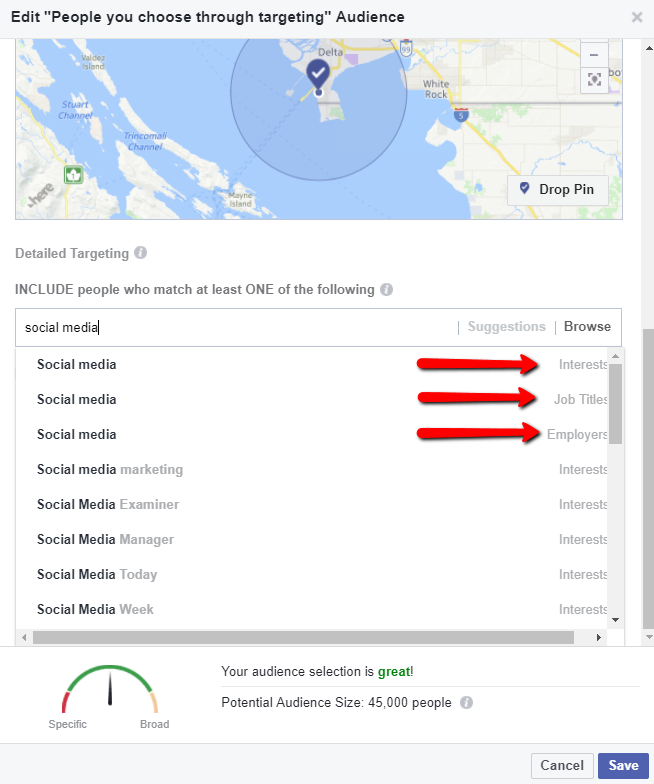 Choose from the selection of objectives (note these change based on the type of post you are promoting, my options here are engagement & messages). Once selected click save. If you would like to add a Call To Action button, select the drop down menu and select the button you would like to use. Locations – Which locations would you like your promotion to occur? You can select countries, provinces, or cities. You can also add a radius around the city – Ex. below: Delta+10 miles. Any audience within 10 miles of the Delta will be eligible to see your promotion. To remove the radius simply click the down arrow beside the miles setting and select “current city only”. Add defining characteristics. Who is your audience? What is their job? What do they do? What are their interests/hobbies? 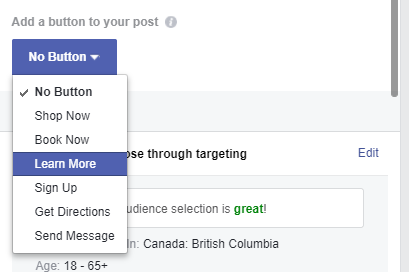 Start typing your characteristics into the detailed targeting box + select the appropriate category. Below I have highlighted the difference in targeting for the term “Social Media”. One is people interested in social media, one has social media in their job title, and the third works for a social media company or company that provides social media services. Once I have selected my audience it will display as shown below. 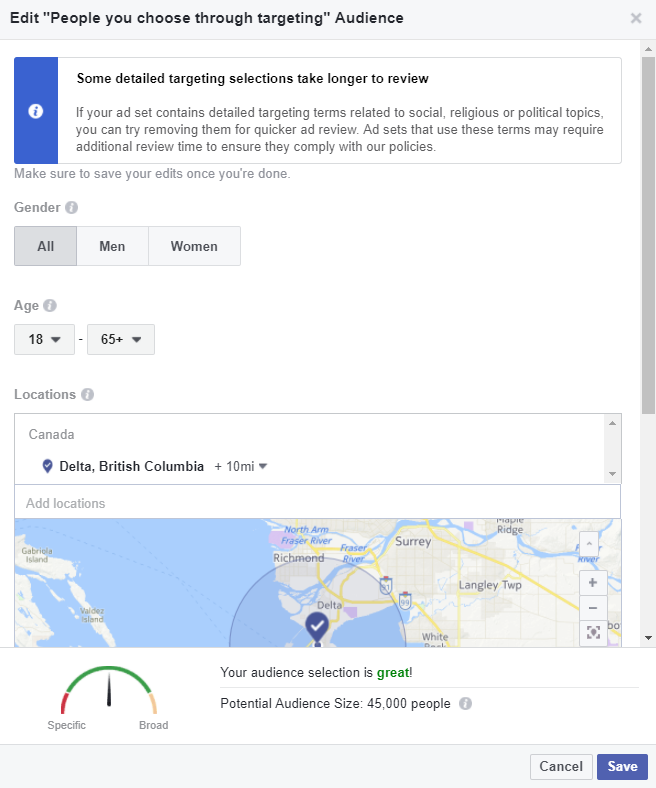 My target market for this campaign is people in Delta (and surrounding areas) and Vancouver who are studying (or who have studied) marketing, or work in SEO, or work in social media in some capacity. 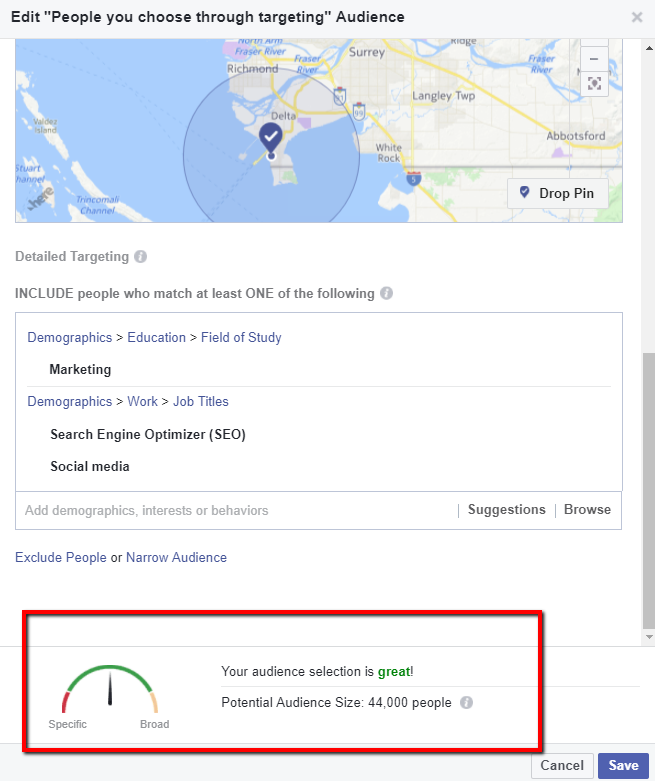 The gauge at the bottom of the screen (outlined in red) will show if your targeting is too specific, good, or too broad, it will also give you an estimate on audience size based on the information provided above. Set total budget for boost – this is how much you will spend. Note – There is a minimum charge of $1/day. 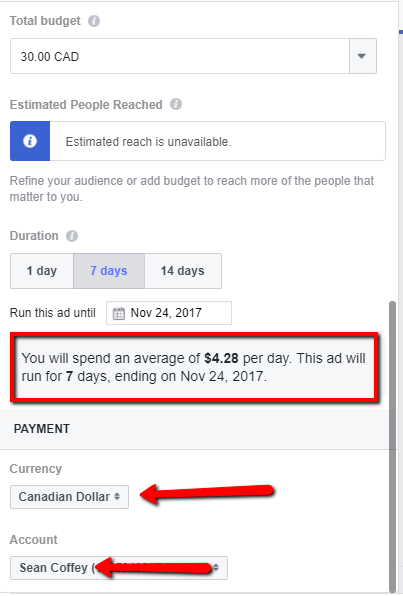 If you are running the promotion for 3 days the minimum total budget is $3 and if you are running for 7 days the minimum is $7. Set duration of boost (how long will it run for). • Review boost overview (highlighted in large red box) this will tell you the daily spend for your promotion (Total Budget / # of Days), the duration and the end date of your promotion. • Select the appropriate Ad Account (if applicable) and review that the correct Credit Card will be charged. This will automatically be the credit card Facebook has on file for you unless you have multiple cards attached. If this is the case you will need to select the correct Ad account. 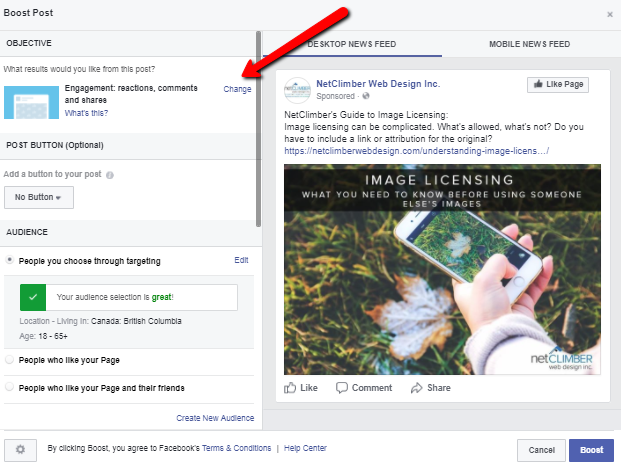 • The Promotion will now be sent for review and either accepted or rejected by Facebook – you will receive a notification once your post has been reviewed. It is generally less than 3 hours.